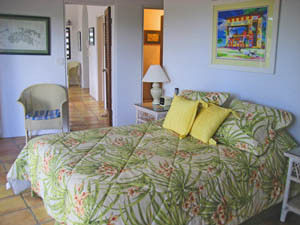 Altamira has three large bedrooms each with a private bath, and all having a continual breeze and great ocean views facing east and south over Rendezvous Bay. Lots of elbow room make Altamira perfect for three couples, as well as a quiet honeymoon. around the house, or by the pool. Beach chairs, beach towels, coolers, umbrella, masks and snorkels are provided. There are floats for the pool. You can walk to a snorkeling area from the home. and refrigerator with ice maker. Outside is a Weber gas grill. Dine inside or outside on the large covered breezeway, or next to the pool. A laundry is in the main building. 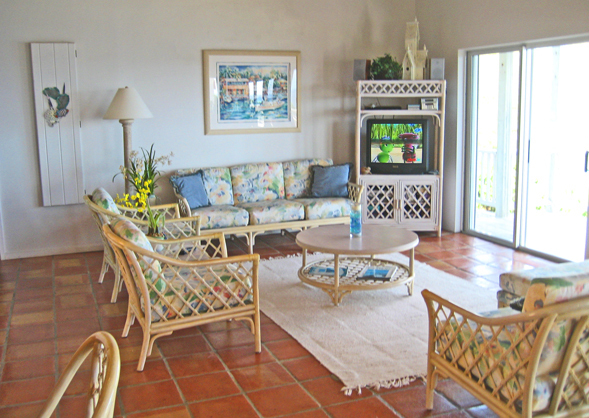 The great room has satellite television, DVD, VCR, stereo system with CD. Altamira has DSL for your laptop connection to the world. Each bedroom has sliding glass doors which open to the deck and the view. 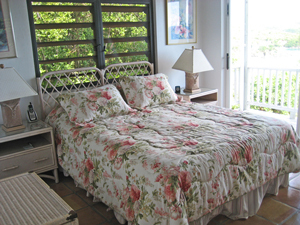 The master bedroom has a queen bed, full bath with an outside protected stone shower, and is in the main house. and can be prepared as either twin beds or a king bed. There is satellite television in the room. but is all under the same roof. A third bedroom is on the lower level and is approached from an outside staircase from the pool deck. and a separate sitting room with satellite television and a small kitchen. The outside garden patio has a hammock for a quiet afternoon nap. No children under 12 years for safety reasons. 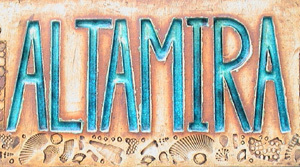 Altamira is two miles from Cruz Bay center on a paved road. An 10% hotel tax will be added. To see the dates that Altamira is available, click here. 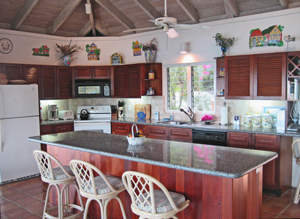 Private Homes for Private Vacations, Inc.
© Private Homes for Private Vacations, Inc. - All rights reserved.